You are currently browsing the tag archive for the ‘Enmore Park’ tag. 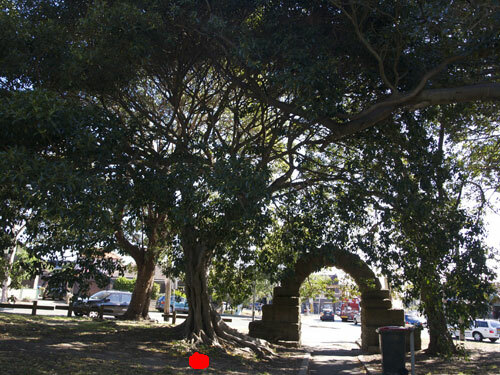 Tree number 7: T218 on the map, a Port Jackson Fig located at the southern entrance of Enmore Park just inside the stone arch near the corner of Enmore & Victoria Roads. I had met with a Marrickville Council staff member in Enmore Park on the 15th November 2013 to discuss the trees up for removal. During that meeting the staff member said they would contract a consultant to see if bracing this particular tree will remove any chance of it falling, but in fairness, I could not write about this until I heard the decision. I am happy to say that the answer is yes. This magnificent Fig with its glorious wide canopy will now be retained & cables or bracing attached to each fork to prevent any risk to the community. This is a terrific outcome as the tree is healthy, has good growth & is laden with fruit. 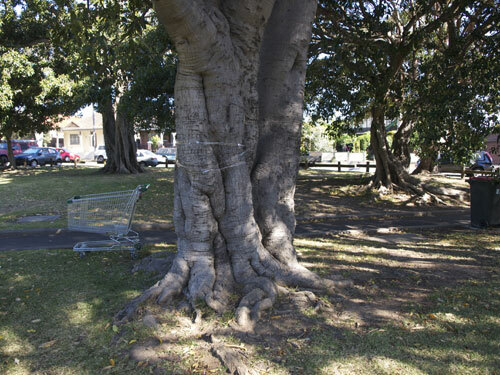 It is one of two Fig trees the line the entrance pathway into Enmore Park. 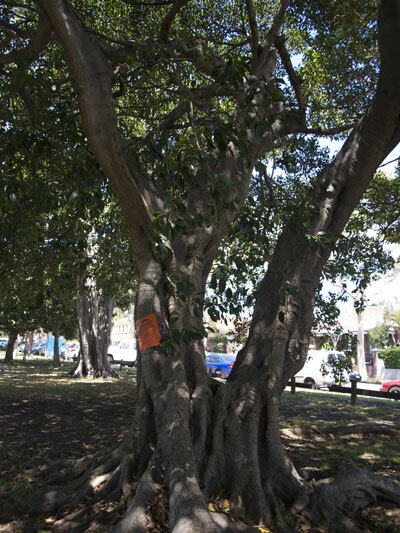 Tree number 8: T221 on map – also a Port Jackson Fig located at the southern entrance of Enmore Park just inside the stone arch near the corner of Enmore & Victoria Roads. Yesterday I was told that Council will give this tree another 12-months. They will remove the grass, fertilize & lay mulch. They will also do some reduction pruning. 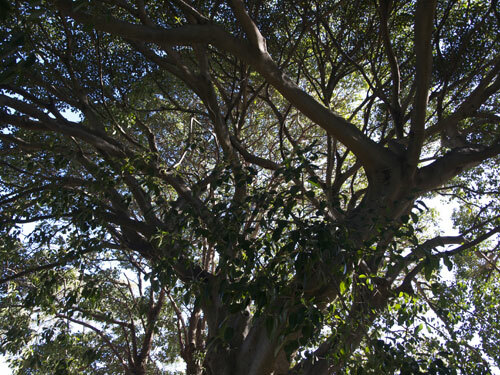 With luck, all this care should have a good result & the community will get to keep this gorgeous heritage Fig tree. 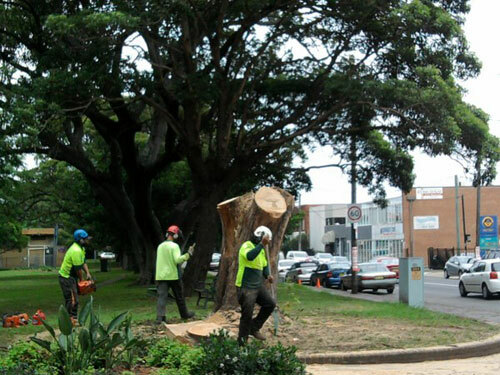 This means of the six old Fig trees to be removed, two have been given a reprieve, the trunks of two trees that are removed will go to re-vegetation sites somewhere in the municipality to provide habitat for wildlife & one will likely become public art, also to be displayed somewhere in the municipality. Only one will become woodchip. I think this is a great outcome. 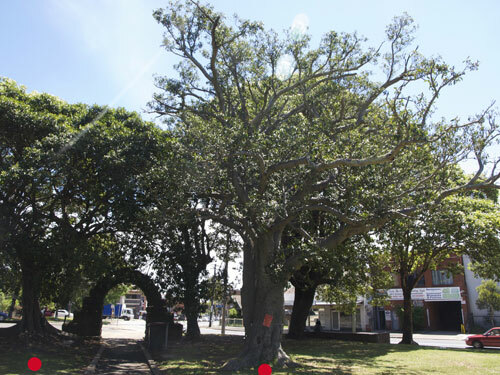 I thank Marrickville Council for going that extra mile to allow both these grand trees to be retained. I sincerely believe that there will be many in the community who will be very happy that these trees will not be lost to Enmore Park – yet. These trees are very valuable because they are large old & beautiful & an important link to the area’s history. Lets’ hope they both respond well to TLC. Showing more of the canopy of the tree that will be braced. This Fig will be given lots of care & hopefully it will spring back. Both these Figs make a wonderful entrance to Enmore Park. This trunk of this lovely Fig tree is 80% hollow. The trunk will become habitat for wildlife in another location. In a nutshell, the news is good. In my submission I asked that Council consider using the trunk of tree 107 as a public artwork for the municipality if the tree is removed. I did not want this fabulous tree trunk to be put through the wood-chipper. See photos below. It was explained that this Fig tree has a very limited lifespan left & because of a number of factors is not doing well (soil, lack of light, epicormic growth, poor soil). It will be removed & a replacement Fig planted nearby with room for this new tree to grow a full canopy, not restricted by other Fig trees as this one is. Council will retain the beautiful trunk of the tree that is removed. 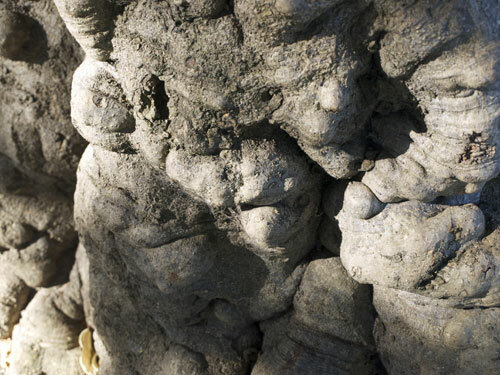 A Tender has been proposed for inclusion in Marrickville Art Post calling for a sculptor interested in creating a public artwork using this tree trunk. 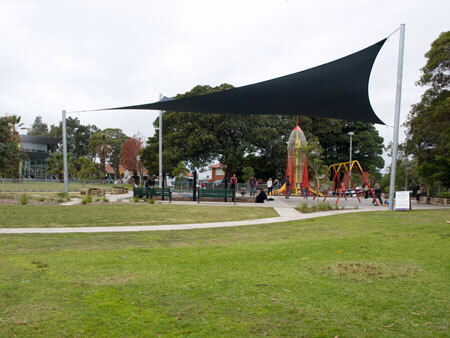 The completed work will be installed somewhere in the municipality where it can continue to delight, albeit with some changes & Enmore Park’s natural history will live on. I also asked Council to consider making the trunk of tree 104 habitat for hole-dependent wildlife. The trunk was inspected & found to have limited appeal to wildlife, as it was open to the sky above making it less likely to be chosen as a home by birds, possums & other wildlife. However, the trunk will be retained & taken to a re-vegetation site in the municipality to be laid on its side & left as more usable & attractive habitat for wildlife. As it decays it will also provide nutrient to the soil. This is a great outcome. We also spoke about the Fig tree that I had missed when I visited this park. The tree has numerous large cavities & obviously presents a significant risk, as it is located at the edge of the park next to the footpath & Victoria Road. I have no doubt that this tree needs to be removed. I was very pleased to be told that the trunk of this tree will also be taken to a re-vegetation site in the municipality to be laid on its side & become habitat for wildlife. It is great for Council to be using trees in this way. 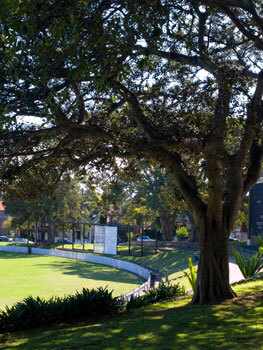 The Fig trees in Enmore Park will have the grass removed from around their trunks & the ground covered in mulch. This will help them considerably. 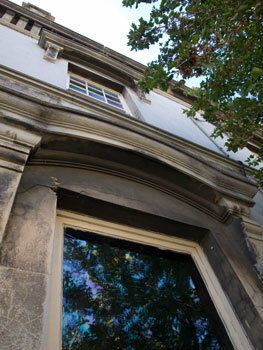 All six Figs will be replaced with other Figs, retaining the lovely look of Enmore Park. Succession planting is important to do if we don’t want to find ourselves in a position where most of the trees have reached a stage where the only option is mass removal & an denuded park. I thank Marrickville Council for being open to ideas on using these trees. I think that many in the community will be happy that the tree trunks of two trees will be used to create habitat elsewhere. Tree holes are hard to come by these days. I also think there are going to be some really happy wildlife, as both tree trunks offer excellent housing. 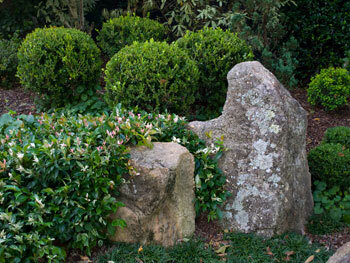 The trunks will also add to the appeal & beauty of the re-vegetation sites, as fallen trees are a natural look. As for turning the fantastically beautiful & interesting old Fig tree trunk into public art – well this is very exciting to me. I am so happy Council was open to this request. I just wish I were a sculptor so I could apply for the opportunity to work with this tree trunk myself. I think the community of all ages will find the artwork not only interesting, but will appreciate that Council has done something meaningful to retain an important piece of our natural history. I can’t wait to see the finished piece. I found the Marrickville Council staff member to be seriously interested in my thoughts & very accommodating answering my questions. It was a great meeting & most importantly, a great outcome for local wildlife & local art. One section of the trunk of the Fig tree that may become public art. Looking further up the trunk of the Fig tree that may become public art. Marked by the red dot. Another tree on the left is to be removed as well. Not a tall tree & not much canopy left, but holes & crevices for wildlife. This tree makes me wonder if the trunk cannot be kept, made safe & made into an insitu home for wildlife like microbats & birds that need hollows. There are so few trees that offer this in our LGA. The canopy is very thin, but would grass removal, pruning, fertilizing, watering & mulching help it to recover? This Fig tree has the most stunning trunk. 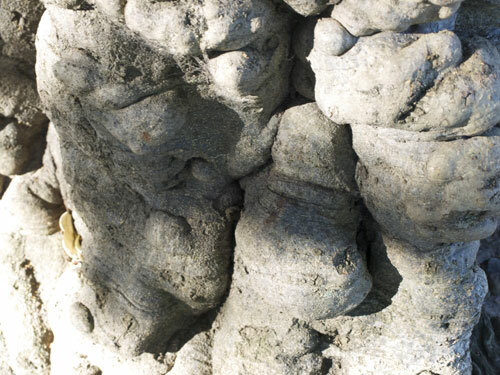 It is knobbly all over & stands straight at around 3-metres tall before any branches are found. My first thought was that if this if the tree could not be saved, then it should not become woodchip. How often do any of us come across a tree of such an age, historical significance & with such a decorative trunk? I think it would be relatively easy to keep the trunk & get a local artist to do something creative with it. If I was doing it, I would randomly remove individual knobs from around the tree & put something of interest inside the hole, then cover with Perspex to keep the hole enclosed & dry. I could easily imagine involving a school or cultural group to find the items of interest. It could become a history tree with a story. 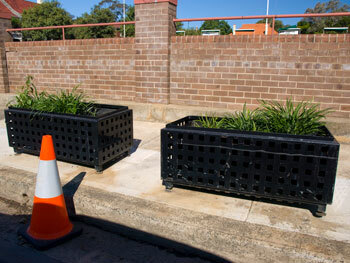 There are many public locations across Marrickville LGA where the trunk artwork could be permanently & safely installed. I will be asking Council to consider saving the trunk for a public artwork. This tree has a stunning trunk that I think could easily be used for a public artwork if it has to be removed. The tree next on the right is also for removal. Part of the canopy. 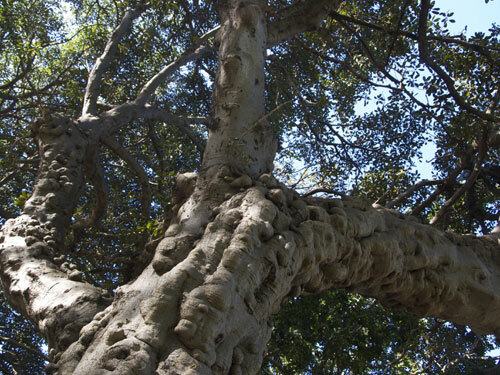 Many of the Fig trees in Enmore Park have been topped in the past. Topping has resulted in the type of branch growth you see here. The whole trunk looks like this right to where the branches form. Squashed in tight. Never had a chance. Damage at the base of this tree’s trunk is easily seen. 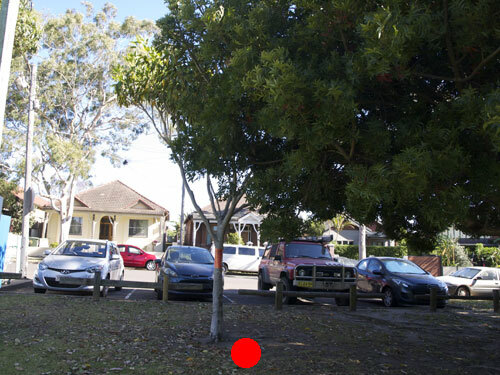 The red dot indicates the Fig tree to be removed. The lower trunk & root system. Has a thin canopy. Maybe anothe tree that would benefit from grass removal, pruning, fertiliising & mulching? 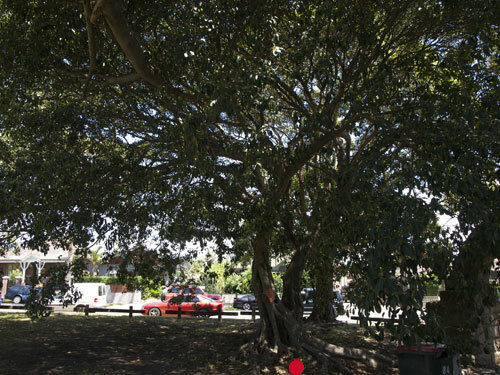 Tree number 9: T227 on map – Moreton Bay Fig located beside Enmore Road. “Tree has extensive internal decay with large internal cavities. independent arborist report recommends removal. Tree failed a Resistograph inspection.” I do not have a photograph of this tree. Planted very close to a substantial tree. Red dot marks the tree up for removal. Red dot marks the tree up for removal. You can see the damage to the bottom of the trunk. Tree number 12: T300 on map – Pyrus sp. (under 5-metres). “Poor quality stock, mechanical damage & not performing.” See image below. Tree number 13: T301 on map – Pyrus sp. (under 5-metres). “Poor quality stock, mechanical damage & not performing.” See image below. Tree number 14: T302 on map – Pyrus sp. (under 5-metres). “Poor quality stock, mechanical damage & not performing.” Interestingly, there is another of these trees that looks the same & which has not been included for removal. All three Pyrus sp. looked like this one. All are about 2-metres or less & all are in flower. 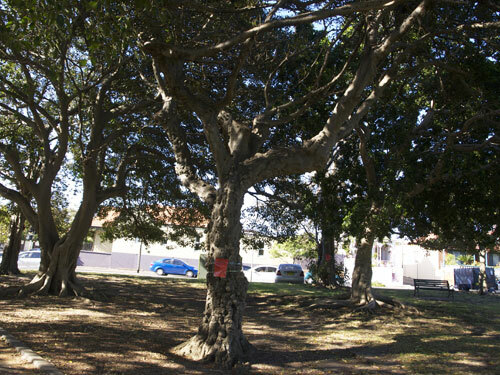 Tree number 15: T303 on map – Port Jackson Fig (under 5-metres). “Poor quality stock with root ball defect. Suppressed by neighbouring tree.” I did not take a photo of this tree. It looks like the others up for removal along here than are under 5-metres. A total of 6 trees up for removal are big old Fig trees. The rest are all sickly & under 5-metres. Why did Council purchase poor quality stock? Why did Council plant trees really close to each other with the outcome that other trees suppress their growth? Even I could see that trees had been planted on top of each other & that there was no room for them to grow a canopy without competition. Same for their roots. Why are so many trees affected by mechanical damage? 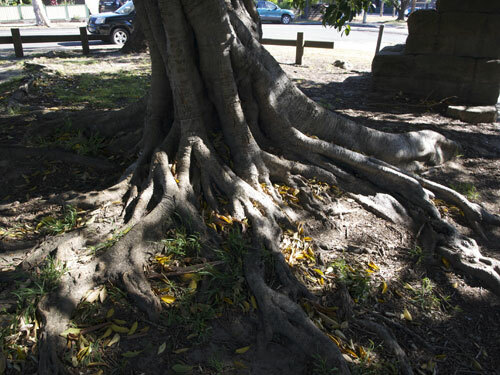 It is not difficult to find trees that have whipper-snipper or mower damage around the base of their trunk throughout Enmore Park. Independent Arborist’s Reports were only mentioned for two of the trees to be removed. 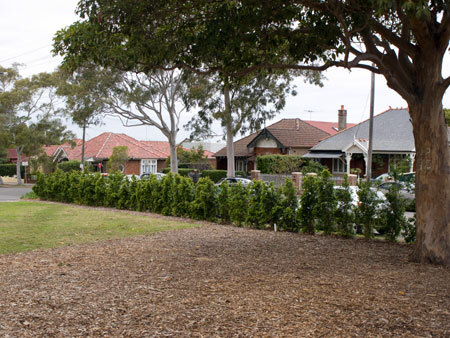 Six of these trees are old & have historic value to Enmore Park & the community. Was an Arborist’s Report done for all of these more significant trees? Council do not even say what species of tree would be planted where in the park, though they have marked the places where new trees will be planted on their map. All, but two, are located along pathways. I sometimes wonder whether design in Enmore Park aims to accommodate crowd volumes during the Australia Day event. It is a hot park & most shade is only to be found around the edges next to the street traffic, or, along the pathways next to the foot traffic. 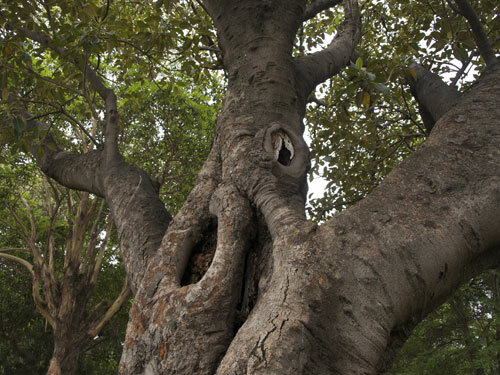 The six older Fig trees have enormous value to the community. We have already lost 31 trees to make room for the pool construction. I am told many of them were old Figs. Another large Fig tree was removed in 2010, as well as a Tulip tree in 2011 & a massive Brushbox in 2013. 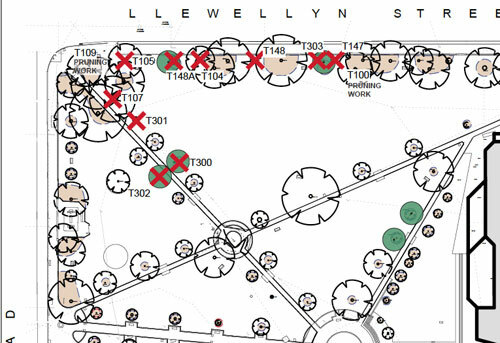 If none of these trees are saved, this would be a total of 49 trees removed from Enmore park within the last 3.5-years. That is an awful lot of trees. Council said that 34 trees were planted around the Annette Kellerman Aquatic Centre when it was completed, but it took me ages to realize 23 of these were actually a Lilly Pilly hedge. 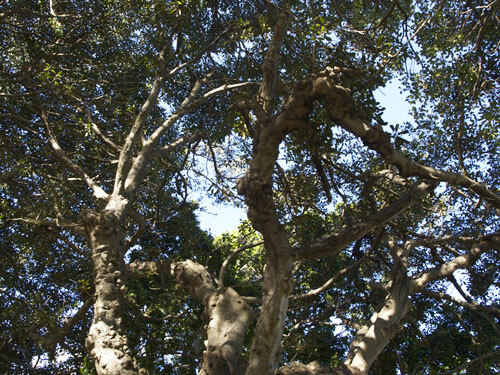 Port Jackson Fig (Fifcus rubiginose) x 3 trees. Moreton Bay Fig (Ficus macrophylla) x 2 trees. Pin Oak (Quercus palustris) x 2 trees – Deciduous tree native to North America & the extreme south of Ontario in Canada. Smooth-bark Kauri (Agathis robusta) x 3 trees – Evergreen coniferous tree native to eastern Queensland & one of the largest trees in the world. This tree grows straight & tall to a height of 30-50 metres. While very slow growing, it can eventually grow a massive girth, so it will be interesting to see where in the park Council plans to plant these trees. Hopefully not somewhere where people will be complaining about falling cones. I am very pleased that Council have planned for large landmark trees that will be one day visible from many parts of the LGA. Chinese Elm (Ulmus Parvifolia ‘Todd’) x 3 trees – Small to medium semi-deciduous tree native to China, Japan, North Korea & Vietnam. Listed as a weed by the Sydney Weeds Committee. Black Booyong (Argyrodendron actinophyllum) x 2 trees– Stunning large rainforest tree native to eastern Australia. Jacaranda (Jacaranda mimisifolia) x 1 tree – Native to South America, but planted all over the world because of its purple/blue flowers in spring & early summer. They can be grown from cuttings or seeds & readily spread. 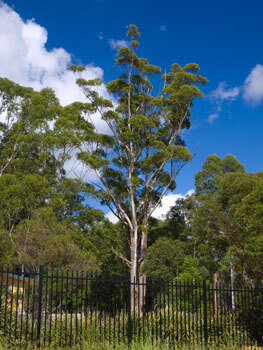 Listed as a weed tree by the Sydney Weeds Committee. 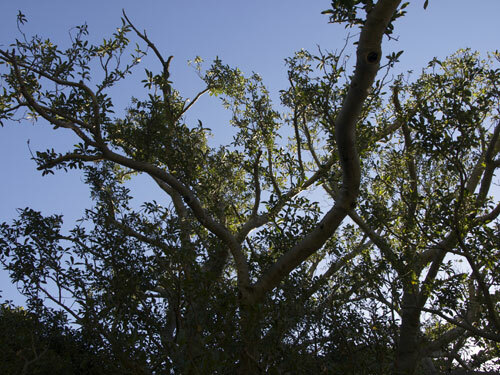 Consider employing an Arborist who is a specialist in veteran trees to see if there is anything that can be done to save any of the older Fig trees. Many other Councils in Sydney do whatever they can to retain their old trees because of their value. I can think of a massive Fig in Scotts Park in Sandringham as an example. The tree has extensive rot. Rockdale Council filled the cavity with concrete, probably to prevent it being set on fire & planted a replacement nearby. Judging by the height of the replacement tree, it was planted around 15-20 years ago. The Fig tree with concrete is very healthy & looks to be around for a long time yet. Even though concrete is not used these days, this intervention allowed a beautiful & important tree to be retained. I can’t help but wonder whether, with the advice of a specialist, if any of our important trees could also be saved. Even one saved would be worth it. Consider using the trunk of tree 107 as a public artwork for the municipality if the tree is removed. 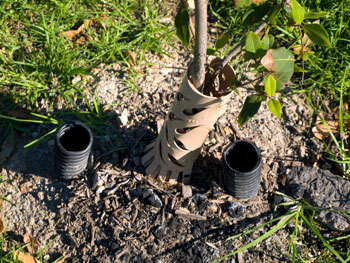 Consider making the trunk of tree 104 habitat for hole-dependent wildlife. I thank Council for using sticky pape to fix the signs to the trees. Any comments or submissions email to – council@marrickville.nsw.gov.au asap, but certainly by the end of October. I will be putting in a submission. If you do send in a submission, I would appreciate it if you would c.c. to all the Marrickville Councillors. Thank you, Jacqueline. 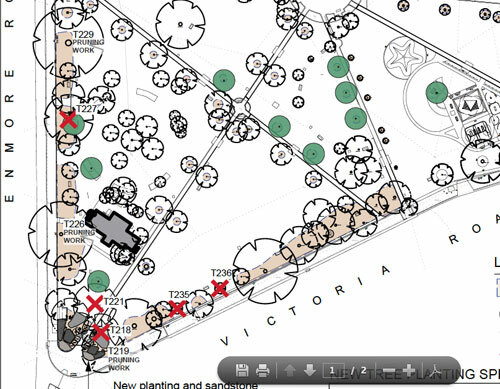 Marrickville Council’s map of tree removal & replacement in Enmore Park. Red Xs mean removal. Green circles means new trees. 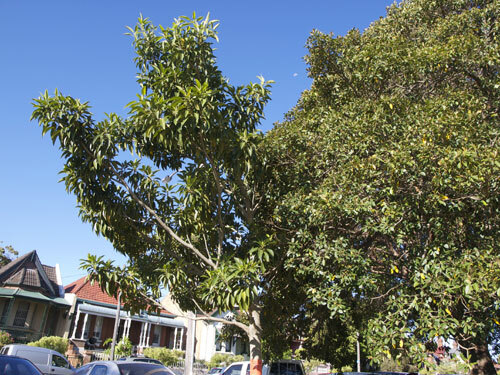 An advanced Brushbox tree has been planted by Marrickville Council to replace the other Brushbox that was removed last March. It’s wonderful that this was done quickly. Thank you Council. What a loss. You can see the massive trunk. Marrickville Council have given “post notification of emergency street tree removal” at of a Brush Box (Lophostemon confertus ) at the Addison Road entry to Enmore Park. The tree was removed 15th March 2013. 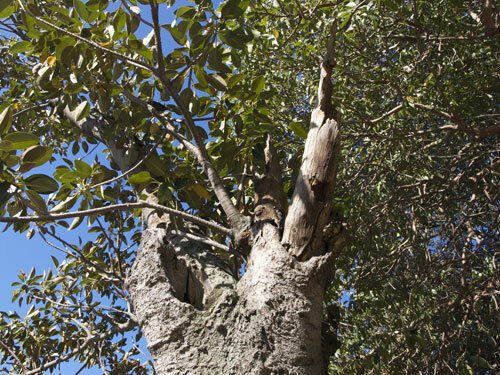 “The tree was identified to have extensive damage from borer & decay from white rot at a major branch junction. Treatment of the borer & rot was not feasible as the extent of damage was too widespread with approx. 50% of the canopy dead as a result. I am happy to say that Council will replace this tree with another Brush Box (Lophostemon confertus) within the next 4-weeks using advanced stock (200L). Extension for tree removal Enmore Park? While visiting the latest tree up for removal in Enmore Park I saw a few improvements. 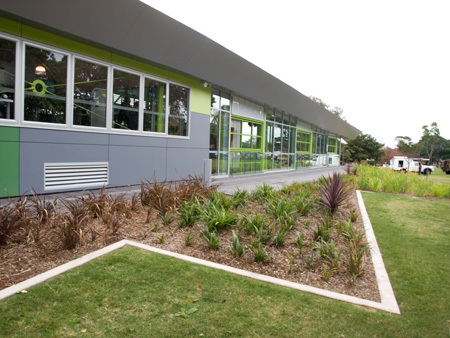 Apart from the new Annette Kellerman Aquatic Centre, which is truly fantastic, Marrickville Council has completed the planting around the pool building. A May 2010 paper from the Major Projects Steering Committee Meeting said, “As part of the new works including the new playground, 34 trees will be planted. In addition 6,500 other small plants are to be included to be planted as part of the project in mass landscape beds surrounding the new centre.” 6,500 plants! I was impressed. It looks like the planting of the 6,500 plants has been completed. They are a series of low-growing grasses & strap leafed plants in blocks of varying shades of green. Interspersed are some red Cordylines as focal points. Easy to manage & dull. I did not see 34 new trees, but I did see 2 new Eucalypts planted at each end of the row of palms along the main walkway & 9 new trees, 3 being the ‘old-faithful’ Tuckeroo trees. They are usually recommended as street trees & I would have thought something a bit more dramatic could be used for a park. At least Tuckeroo’s provide berries for birds. Still, new trees are great & I look forward to seeing what Council plants with the other 23 trees. They are needed as Enmore Park still has masses of room for trees. A total of 51 trees were removed to build the pool so the replacement numbers are considerably less. What I really liked was the newly planted hedge of Lilly Pillies on the perimeter of the park on Black Street. Council hasn’t been penny-pinching with their planting here so the hedge will grow nice & thick. It will not only add beauty, but it will also buffer some of the noise from the playground to the residents of Black Street as well as protect both the park & the playground from traffic noise & some air pollution. The Lilly Pilly hedge will also provide habitat for small birds & food for a range of urban wildlife. Birds & flying foxes love the fruit. 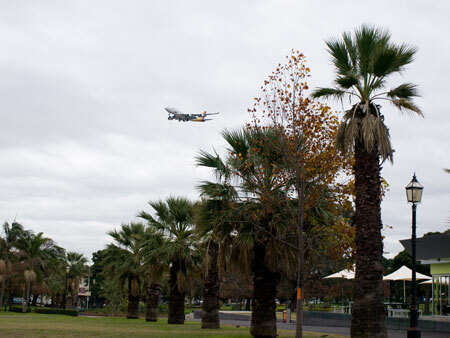 I thank Council for doing this & hope they plant many more hedges around the LGA over time. The new playground looks attractive & is fun for the kids judging by the many happy kids I saw playing there. The playground is designed to contain the kids & allow easy supervision by adults. The Lilly Pilly hedge also acts as a barrier for any fast toddlers that streak towards the road. I am glad Council decided to retain the rocket as a number of people told me that they did not want to lose this. Last, but not least is the new seating around the playground. The park benches & seating with a table are great & there are plenty of them. 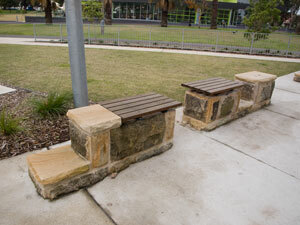 Really excellent are the creative stone & wood benches. I liked them a lot. I may not agree with chopping down the Tulip tree, but I do think Marrickville Council has done a good job with the latest improvements in Enmore Park. My husband on the other hand totally disagrees with me. As we discuss what I write he said he thought this post was rubbish & my reticence to write negative things about Council has coloured this post. He thought the hedge was great, but “Tuckeroos in a park! What the f*** for!” About the expanse of grasses around the pool… “More grasses! Council’s design, imagination & value to wildlife is like having a car & only driving it in first & second gear.” So there you have it. Domestic dissent. 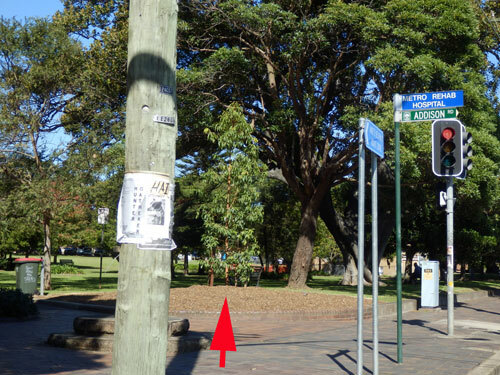 Yesterday Marrickville Council posted a Notice of Removal for a Tulip tree (Liriodendron tulipiferum) in Enmore Park. As usual, the Council web-link provided for further information did not work at the time of writing. Does not conform to landscape design. They say they will replace the tree with a Port Jackson Fig (Ficus rubiginosa), but as usual, don’t say when they will do this. Great – a Fig, but to chop down a healthy tree in a park where there is loads of empty space just because it doesn’t fit into their design? 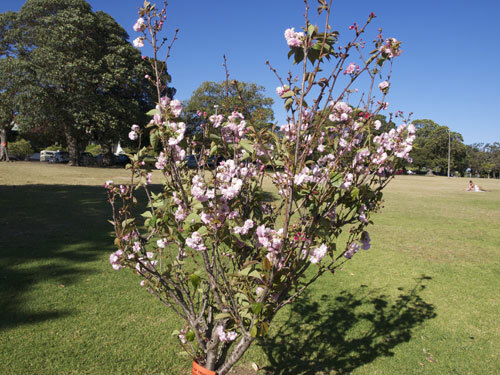 Council says this tree is an ‘inappropriate species for location.’ Why did Council plant a Tulip tree in Enmore Park in the first place if they consider the tree an inappropriate species? Why is a Tulip tree an inappropriate species? Why is it okay for Tulip trees to be planted as street trees less than 1km away, yet be ‘inappropriate’ for Enmore Park? How many years has the tree been there? Why does it bother Council now? I cannot come up with any ideas why a gorgeous & not at all common Tulip tree would be inappropriate for a large park. Is it like kitchen & bathroom designs that change with the fashion? The Tulip tree is about 5-6 metres tall & situated close to a row of palms that used to delineate 2 areas of lawn. Now one side is lawn, the other is the concrete walkway surrounding the Annette Kellerman Aquatic Centre. 3 palms away, there is another tree close to the palms. So, I suspect they will soon think this is also unsuitable and will have to go. Council says the tree “does not conform to landscape design.” I agree. However, the palm trees have been there for a very long time & someone in Council planted these 2 trees directly next to this row of palms a number of years ago. Even before the building of the pool, the placement of these 2 trees was an odd choice. Not so odd though, that the tree should be chopped down. Someone suggested to me that the 2 trees were part of a row of trees intended to be planted next to the palms, but that Council didn’t complete this plan. I must say this makes sense as to why these trees find themselves near the row palms. I don’t believe this tree should be axed. It is healthy, it shouldn’t lose its life simply for visual conformity & it is beneficial in carbon sequestration & cleaning the air. That it is just only one tree in a park & is therefore expendable is not a convincing argument for me. 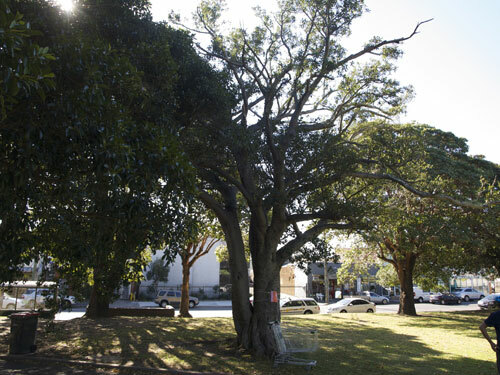 Enmore Park has already lost 51 trees to make room for the pool, plus a large Fig tree was removed in 2010. To be fair to Council, Tulip trees have a symmetrical & pyramidal growth habit & once mature, can have a 12-metre canopy & reach a height of 24-metres. If it does grow like this, it will eventually overtake the palm. 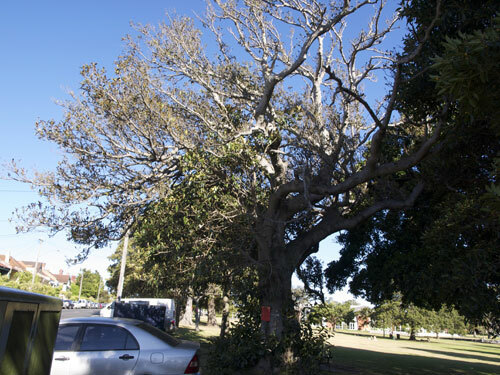 Council could choose to transplant this tree a few metres away. These trees cope with transplanting as long as water is kept up them while they are settling in. Enmore Park is a boggy park after rain. Tulip trees love these conditions, which is probably why this species was chosen in the first place. The tree is small enough not to make transplanting an impossible job. Springtime is recommended for transplanting these trees to prevent stress & increase the chances of survival. 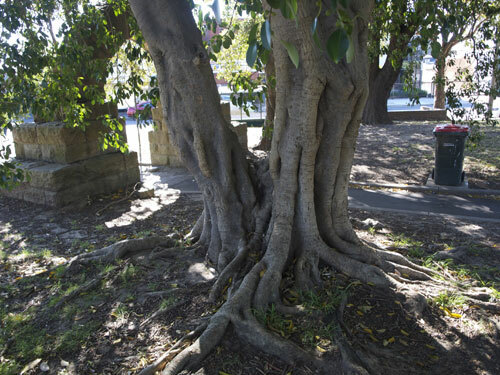 Council say they will replace the tree with a Port Jackson Fig. Well I would be surprised if they are planning to plant it where the Tulip tree is currently located. If they do, they will only be recreating the same problem. 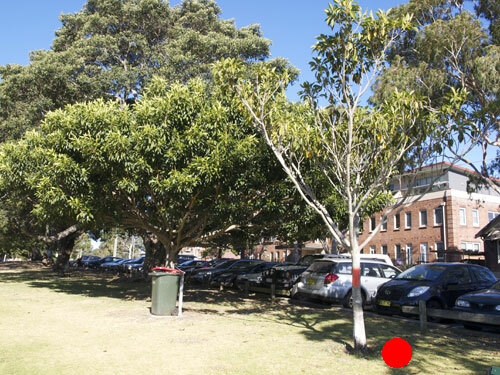 Enmore Park could easily cope with another Fig as well as keeping the Tulip tree by moving it to another location. I will be putting in a submission regarding this tree & requesting that it should not be chopped down, but just transplanted a few metres away. The evening opened up with an Extraordinary Council Meeting about our Sister City relationship with the island of Madeira, which was recently struck by flood & landslides killing 42 & injuring 250 people. Discussion covered recognising the devastating effects of this & other recent natural disasters, Council’s poor financial position, the lack of financial capability to reciprocate to an equal level when representatives from Sister Cities visit Marrickville, the large numbers of Sister Cities we have & whether this should be reduced (imagine, “sorry sister, it’s goodbye”) & developing a policy regarding financial assistance to Sister Cities when Council is having problems financially supporting its own services. The motion was carried to donate $5,000 from the Sister Cities budget to help with rebuilding the affected area. Mayor Iskandar had the deciding vote. Then came the Development Assessment Meeting. One wouldn’t think that DAs are interesting unless they directly concern you, but actually they are. People from both sides feel quite passionate & emotional about DAs. Some were frustrated by the time required for the DA process. Local residents were concerned about developments they felt would significantly change the streetscape in terms of set-back & visual impact. Height, noise, parking, privacy & loss of light were other issues causing concern. I have seen these issues raised many times both inside & outside Council meetings. People who become involved by attending Council meetings, signing petitions or lobbying against certain DAs hold the streetscape of the Inner West in high regard & they want to retain it. It appears that some people new to the area & developers want to build more modern buildings & this causes a conflict with the other residents. Given that these developments are being built, I don’t think it will be too many years before the visual outlook of great chunks of Marrickville LGA will be significantly changed. Unlike Haberfield, which has decreed no modern buildings will be allowed & heritage will be protected at all cost, Marrickville LGA does not seem to have a policy like this. I could be wrong, but it seems to me that if a DA ticks all the boxes, it is up to the councillors as to whether it gets approved. Naturally, the Councillors have differing perceptions of taste & beliefs as to what constitutes appropriate outlook, as well as what should be knocked down. Many cherished buildings considered heritage by the Marrickville Heritage Society & other authorities have been demolished over the years. Last night one developer said the plans for a large residential development were “unashamedly contemporary,” yet the area this development is situated is one of the most historical in the LGA in terms of housing, other buildings, parks, trees & other historical infrastructure. I see some box-like buildings plonked next to softer, filigree terraces, but I belong to Marrickville Historical Society, so of course I prefer the older buildings. Only last week Paul Keating said on Lateline, “Well, I can’t teach you good taste” when speaking about the 60 storey glass hotel in red planned for a finger pier at Barangaroo. Interesting that I liked much of the proposed development, but not this particular building. I mention the issue of development & taste because our suburbs are changing. Marrickville LGA is about to embark on major new development & much of it will be high-rise. A lot will get through because the state government wants us to have housing for something like another 10,000 people & frankly Marrickville Council desperately needs the money which comes from Section 94 contributions (what the developers pay to Council). The Councillors need our input either directly or via community lobby groups. Mayor Iskandar said this in both Marrickville Matters & the Inner West Courier recently. He also said that the changes coming would affect the community for at least the next 25 years. If we don’t let the Councillors know what we don’t want, then we will have to accept what the developers give us. 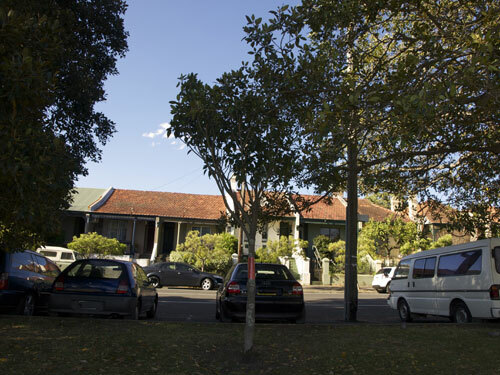 Very soon, a DA for a Backpackers in Addison Road Enmore will come before Council. This is a 130 plus bed establishment with 7 parking spaces, 2 of them designated Disabled Parking. Is this of consequence? Judging by the speakers last night & other recent community action regarding the proposed development on the old Marrickville RSL site, parking is a huge issue in people’s minds. Council is passing DAs where residents question the parking ratio & sincerely believe parking opportunities will be worse with the new development. It’s changing times. Denser living will further impact on parking. Backpackers often have sufficient funds to buy a car & most residences have at least one car & sometimes more than two. Council & the government are encouraging public transport use, but living close to a railway station really doesn’t have much of an impact on vehicle ownership yet. Perhaps later it will when petrol becomes costlier. For now, there is the problem with a transport system that is already deemed inadequate. It’s all food for thought. Moving to trees, a DA at 23 West Street was passed last night. This site will have 8 double storey modern townhouses built on a block where there are two 9 metre Council protected Canary Island Palm trees & a Fiddle Leafed Fig tree on the boundary of the back property. Council’s own report stated that Canary Island Palm trees only live for 15-40 years so the development would ‘outlive’ them. In fact, these trees generally live for 150-160 years, which is an enormous difference. 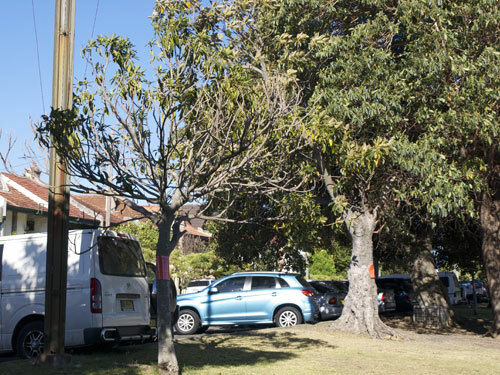 The Councillors agreed these 2 trees will be relocated to the back of the development, stipulating the root protection zone of the Fig tree will also be protected. This is a good thing, though I’m sorry we will lose the Palms from the streetscape, which has or is about to lose 31 trees on the opposite side of the street. Change. 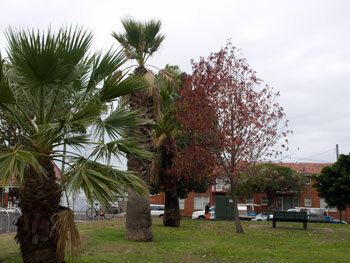 It was good to hear that Palms relocated at Enmore Park for the swimming pool development are doing well. Another DA passed was 63 Grove Street St Peters which will erect 34 double storey dwellings. 2 mature trees will be removed, yet the landscaping is great. They intend to plant 10 trees capable of growing to 15 metres, 19 trees reaching 5 metres, 9 trees reaching 7 metres, 10 trees reaching 8 metres & 46 trees reaching 5 metres. 94 trees in total. They also intend to preserve the current street trees. I wish all developments planted this percentage of tall growing trees. One final point of interest is that various sites across Marrickville LGA are considered contaminated, so don’t eat the dirt. 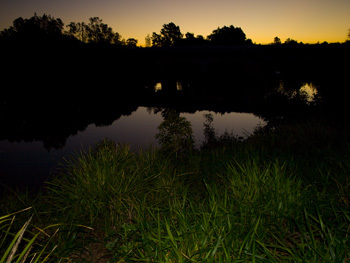 There is some serious toxic stuff around from poor industry practices in the past & dumping. Like toxins that live on to create problems decades later, we need to think if an upcoming development will also be like that & whether we want to be involved in community consultation to shape our community for the better.